Paulo Freire was a Brazilian educator with some pretty radical ideas about education and its role in creating better societies. To Freire, education was a revolutionary act. His most famous work is the book Pedagogy of the Oppressed. He discussed his practice of literacy education in Brazil. Through his service as the director of adult literacy programs in Sao Paulo and his other writing, Freire developed a school of thought that came to be known as critical pedagogy. 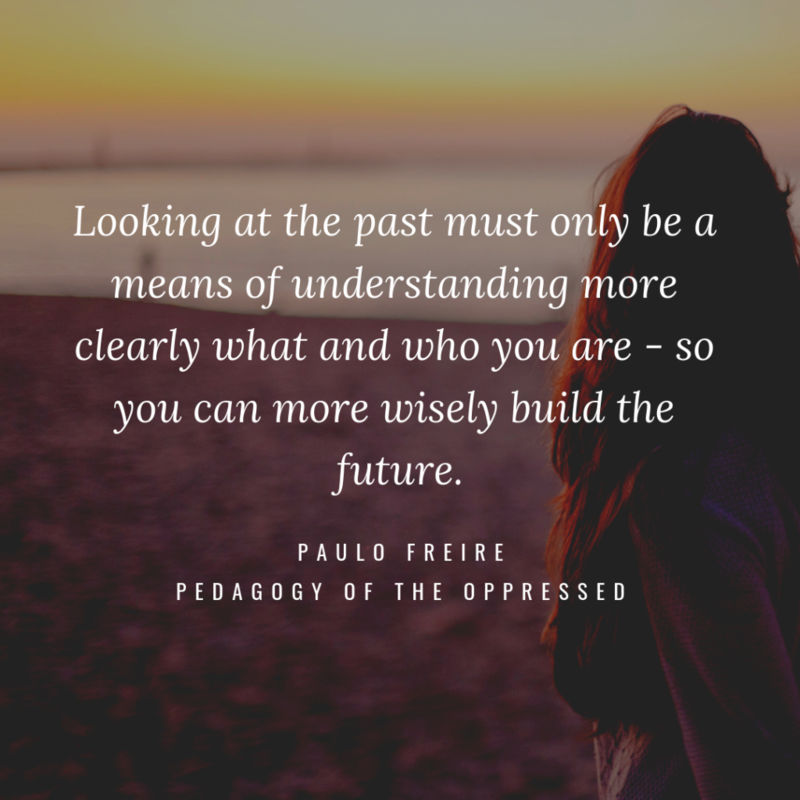 Below, I’ve collected a few of the more interesting and/or famous quotes from Paulo Freire to help illustrate some of the key ideas of critical pedagogy. 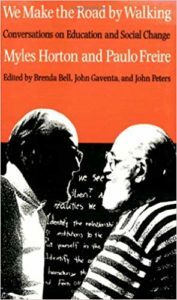 Paulo Freire’s first, and by far most famous, work is Pedagogy of the Oppressed, so naturally many of his most well-known quotes come from this book. 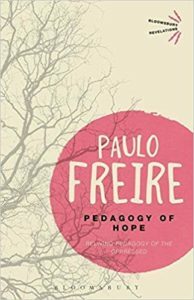 If you’re unfamiliar with Freire, this is the best place to start to learn about critical pedagogy. Looking at the past must only be a means of understanding more clearly what and who they are so that they can more wisely build the future. This is perhaps one of the more mainstream quotes. 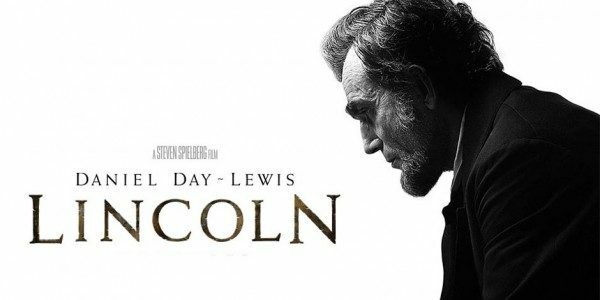 Many people would agree that the purpose of learning about history is to understand ourselves and to pave the way for a better future. While not revolutionary, it’s an important reminder that history has no inherent value, and we shouldn’t be studying it “just because.” This is the premise behind the idea that we ought to be organizing social studies curricula and teaching history thematically instead of chronologically. There’s no such thing as neutral education. Education either functions as an instrument to bring about conformity or freedom. This quote actually appears in the introduction to the book, and it was written by Richard Shaull. But it is a logical conclusion to be drawn from Freire’s work – education is inherently political and revolutionary. Personally, I find this to be a liberating idea as an educator. Once you understand this, you can abandon the futile attempt to be completely neutral and unbiased. Sure, you should remove yourself from the equation and let your students come to their own conclusions, but it’s a fallacy to think that you can be entirely neutral throughout this process. Leaders who do not act dialogically, but insist on imposing their decisions, do not organize the people–they manipulate them. They do not liberate, nor are they liberated: they oppress. This is an important idea for educators, but also for organizers. No matter what your intentions are, you can’t force ideas onto people. You either co-create them with people, or you’re inadvertently oppressing them. This concept reminds me a lot of The Ugly American. It is necessary that the weakness of the powerless is transformed into a force capable of announcing justice. For this to happen, a total denouncement of fatalism is necessary. We are transformative beings and not beings for accommodation. In other words – embrace your political efficacy. This is a big challenge sometimes when I work with kids on Project Citizen. There’s always someone with a fatalistic attitude that things are the way they are, and you can’t ever fix them. So why bother? To glorify democracy and to silence the people is a farce; to discourse on humanism and to negate people is a lie. Make sure your values and your actions are in alignment. Can you be a great civic educator, if you’re not practicing and living democratic values in your classroom? The more students work at storing the deposits entrusted to them, the less they develop the critical consciousness which would result from their intervention in the world as transformers of that world. The more completely they accept the passive role imposed on them, the more they tend simply to adapt to the world as it is and to the fragmented view of reality deposited in them. So true. In my school, I find that students have for years been trained to “store the deposits entrusted to them.” Getting them to really think critically is tough. More recently, I wonder if the emphasis on “rigor” and the technical tasks of literacy and math aren’t just a new iteration of this banking model of education. Instead of tasks, we’re teaching skills, but we’re still not teaching students to actually critically examine the world. We Make the Road by Walking: Conversations on Education and Social Change is a different kind of book. It’s literally a conversation – a dialogue, a la Socrates – between Paulo Freire and Myles Horton. Myles Horton was another radical educator from the United States who played a role in the Civil Rights Movement of the 1950’s and 1960’s. The book was published back in the 1980’s. It is excellent and worth a read, but here are a couple of quotes to give you a taste of what’s in it. The teacher is of course an artist, but being an artist does not mean that he or she can make the profile, can shape the students. What the educator does in teaching is to make it possible for the students to become themselves. I love this metaphor of a teacher as an artist – like a sculptor who helps a piece of art emerge from a rock. As an artist would say, the image was always there. He didn’t create it, he just removed the parts that didn’t belong. The educator has the duty of not being neutral. This is similar to the quote above that education cannot be neutral. But it goes a step farther and reminds us that we have a choice as educators. By remaining neutral we’re not ensuring a “neutral” education – we’re just ensuring that someone else is dictating the purpose of that education. Pedagogy of Hope: Reliving Pedagogy of the Oppressed is pretty much what it sounds like. 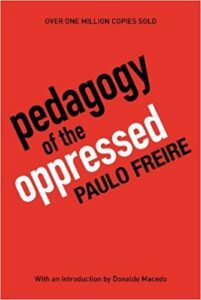 In this book, published towards the end of the career, Freire reflects on his thoughts in the Pedagogy of the Oppressed. 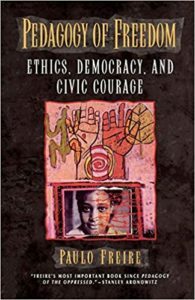 Decades of history and practice help add nuance to his initial thoughts and more fully explain his theory of critical pedagogy. If the great popular masses are without a more critical understanding of how society functions, it is not because they are naturally incapable of it—to my view—but on account of the precarious conditions in which they live and survive, where they are “forbidden to know.” Thus, the way out is not ideological propaganda and political “sloganizing,” as the mechanists say it is, but the critical effort through which men and women take themselves in hand and become agents of curiosity, become investigators, become subjects in an ongoing process of quest for the revelation of the “why” of things and facts. Again, people are conditioned not to question. This can be one of the most frustrating part of teaching older students. Younger kids are naturally curious and love to question things, but the further along students are in their “education” the more likely it is that they’ve internalized the need to just seek out facts and complete rote tasks. If anyone, on the other hand, assuming a democratic, progressive position, therefore argues for the democratization of the programmatic organization of content, the democratization of his or her teaching—in other words, the democratization of curriculum—that person is regarded by the authoritarian as too spontaneous and permissive, or else as lacking in seriousness. This quote is spot on. People have such a hard time grasping how you can give up control over the content of a course. 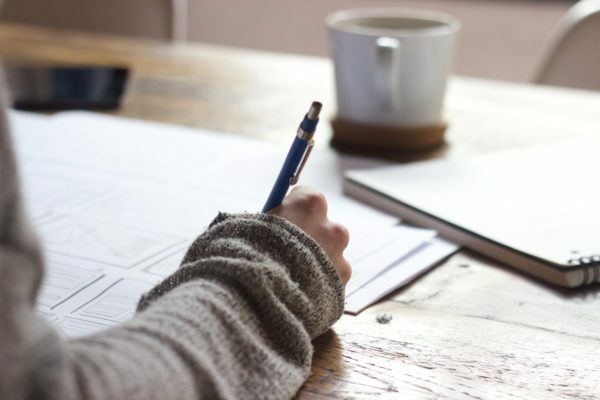 There’s a curriculum guide, and you have to follow it… right? Well, if you’re just trying to deposit information in a person’s brain, yes. If you actually want them to learn, you need to be flexible. Pedagogy of Freedom was published at the end of Paulo Freire’s career, just before he died. It comes with the benefit of decades of experience and reflection, and it can be read as a culmination of his theory. It’s historical context is also somewhat different – with the original Pedagogy of the Oppressed being rooted in an industrializing society, while Pedagogy of Freedom is born of a newly globalized society. It’s in making decisions that we learn to decide. There’s a reason that “evaluating” is high on Bloom’s taxonomy. Whoever teaches learns in the act of teaching, and whoever learns teaches in the act of learning. This is a common theme of Paulo Freire – teaching and learning are reciprocal acts. You can’t do one without the other, at least not if you’re doing it right. What’s Your Favorite Paulo Freire Quote? Looking to decorate your classroom? I took three of these quotes and created printable posters with them. Just fill out the form below, and I’ll send you a link to download them. One could probably go on for days, exploring interesting and poignant quotes from Freire’s work. In fact, the list above doesn’t even touch on all of his work. I’m curious – what’s your favorite Paulo Freire quote? What’s your favorite book that he wrote? Drop a comment below and share.